An entirely new design right down to the fonts, the Slim d’Hermès is all about simplicity combined with striking details, that together create an unostentatious yet distinctive wristwatch. 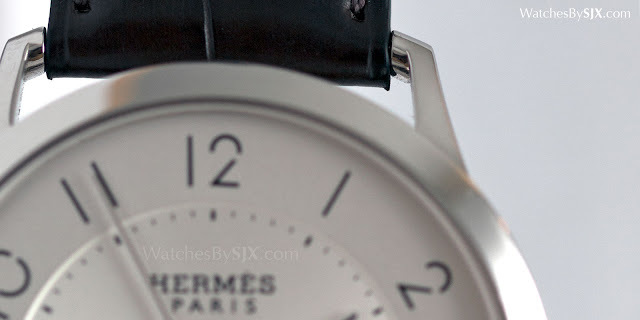 Hermes watches usually tend towards distinctive yet simple forms, like the Dressage or Arceau. 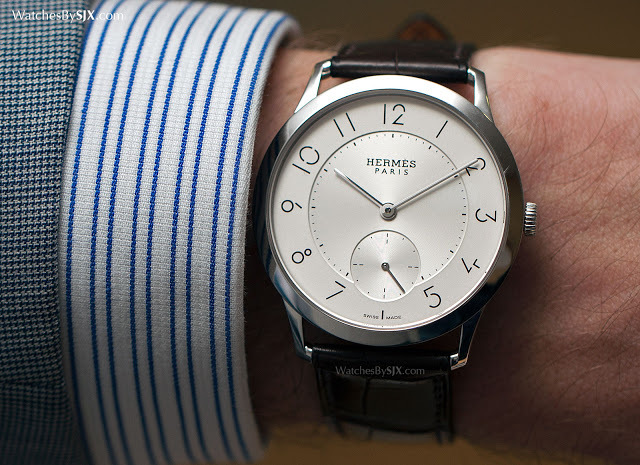 Recently unveiled at Baselworld 2015, the Slim d’Hermes is clean and concise, but with well conceived details that give it a recognisable look, much like the creations of F.P. Journe. 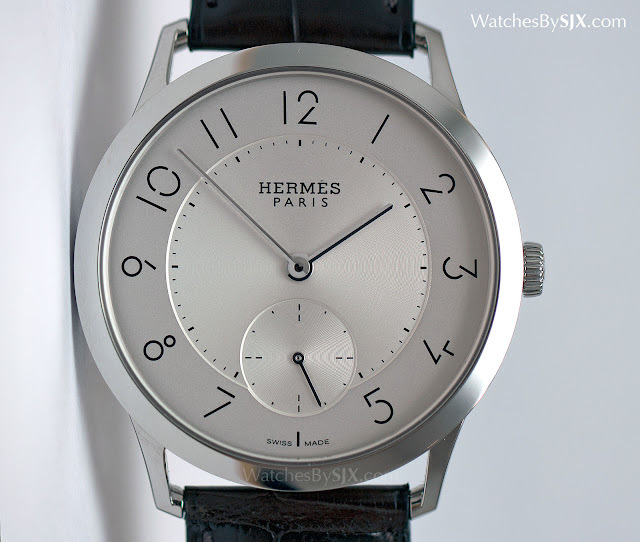 The Slim d’Hermes was conceived as an extra-thin wristwatch, with the H1950 movement inside standing just 2.6mm high (comparable to record-setting slim movement from the likes of Piaget which are 2.3mm to 2.4mm tall). But it had to be different and distinctive, meaning the conventional extra-thin aesthetic of stick indices and hands was ruled out. 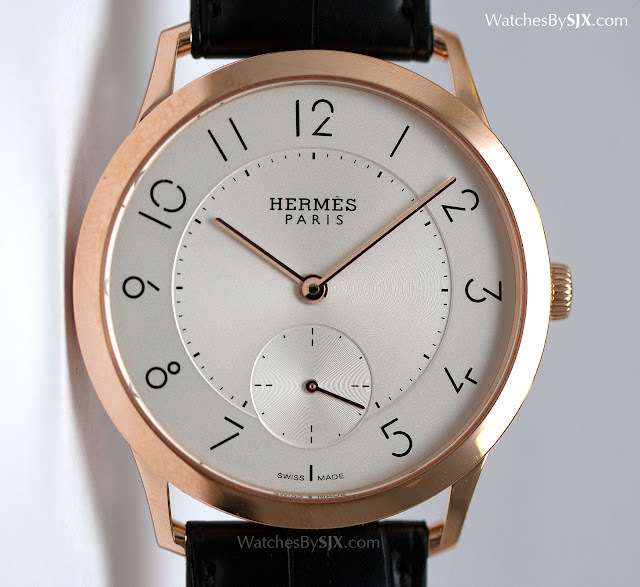 So Philippe Delhotal, the Creative Direction of Hermes’ watch division, added nuance to simple details, most notably the font for the numerals, designed specifically for this watch. 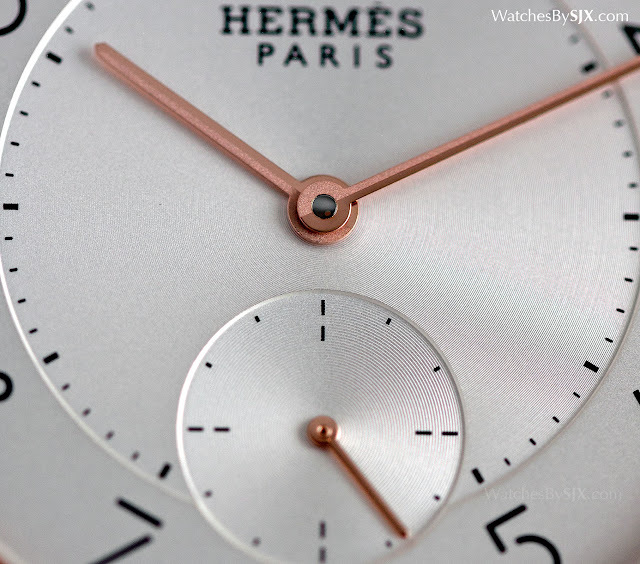 Created by graphic designer Philippe Apeloig, Hermes correctly characterises the font as “light, airy… lively”. Best known for his posters, many of which are in MoMA’s collection, Apeloig specialises in typography and logos. His Slim d’Hermes font is trim and elegant yet quirky enough to be recognisable at a distance. The hands are simple in form, but finished carefully with mirror-polished and matte frosted vertical halves. At certain angles the polished halves of the hands appear black, enhancing legibility but also complementing the numerals. 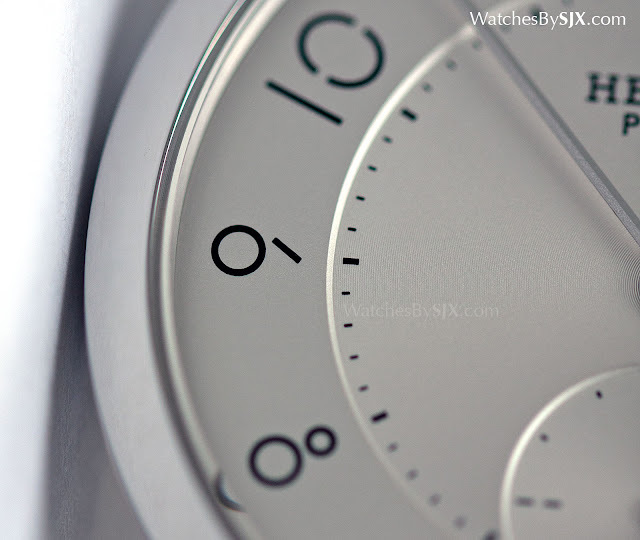 Made of brass and silver-plated, the dial is stamped to give it three levels: the chapter ring with the hour numerals, an inner section and the sub-seconds. 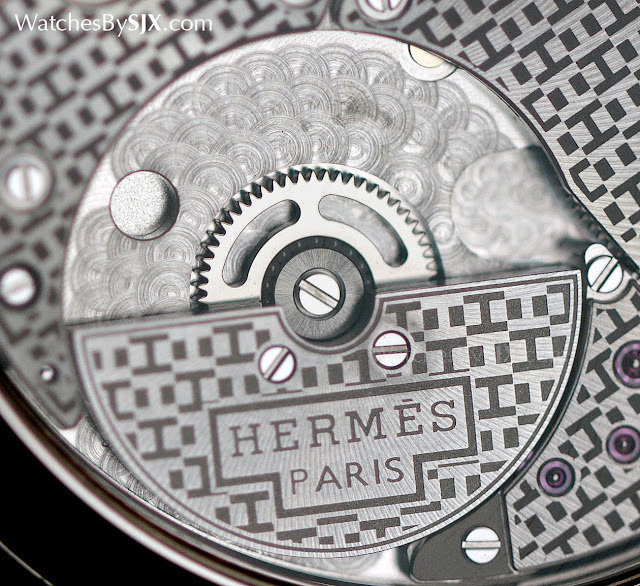 Both the inner section with the minute track as well as the seconds register have an azurage guilloche finish – a stamped pattern of fine concentric rings that is only evident up close. The H1950 calibre inside is based on the VMF5300 movement made by Vaucher, a movement manufacturer in which Hermes owns a quarter stake. The straight edges and geometric shapes of the bridges have been customised for Hermes, along with the embossed repeating “H” decoration. 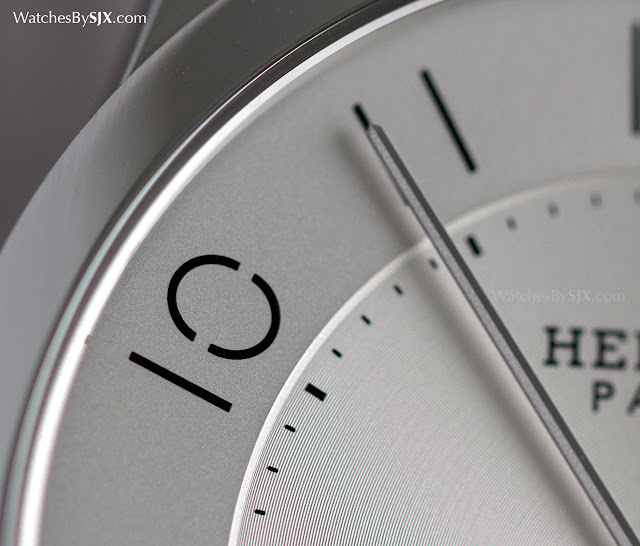 At 2.6mm high the H1950 is a slim movement, thanks in part to a micro-rotor. 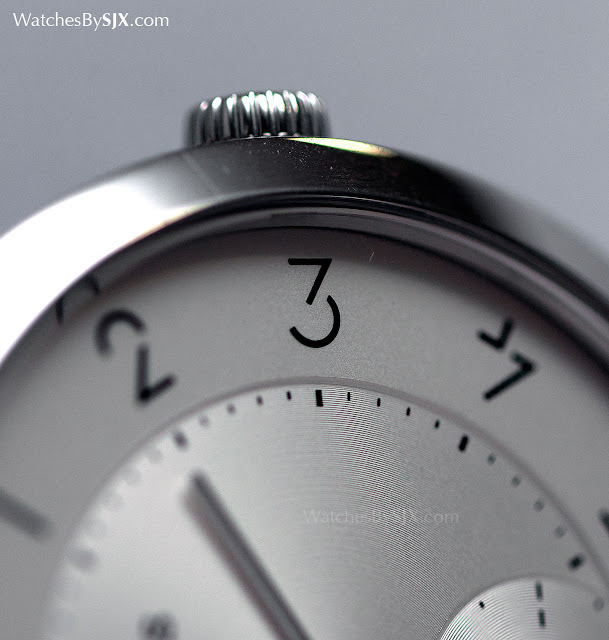 At 13 3/4″‘ or 30mm in diameter it’s fairly wide, so it is a good fit for the 39.5mm case. 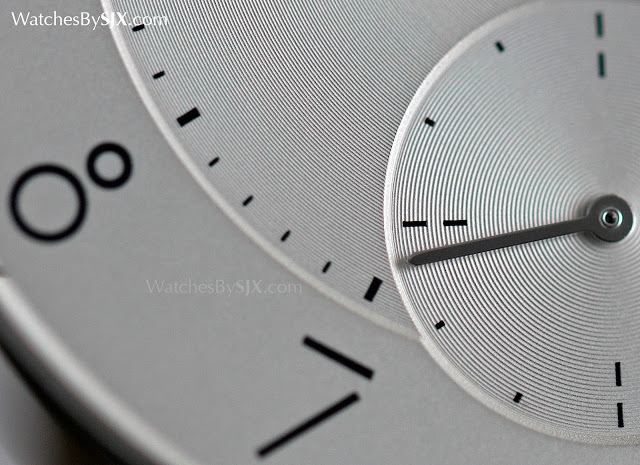 Though modestly sized, the case has wrist presence, with the slim bezel and clean dial making it seem larger. The lugs are not immediately obvious but form a strong part of the design. They turn sharply inwards towards the strap, bringing to mind Bauhaus. 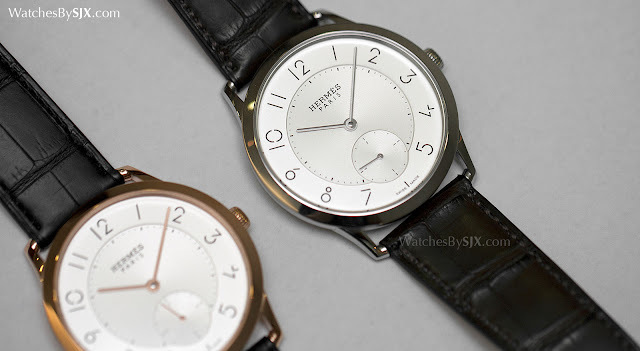 The Slim d’Hermès prices are as follows: Rose gold – US$18,500, SFr16,500 or S$26,040 Steel – US$7650, SFr6900 or S$10,900 They are expected in stores June or July 2015. 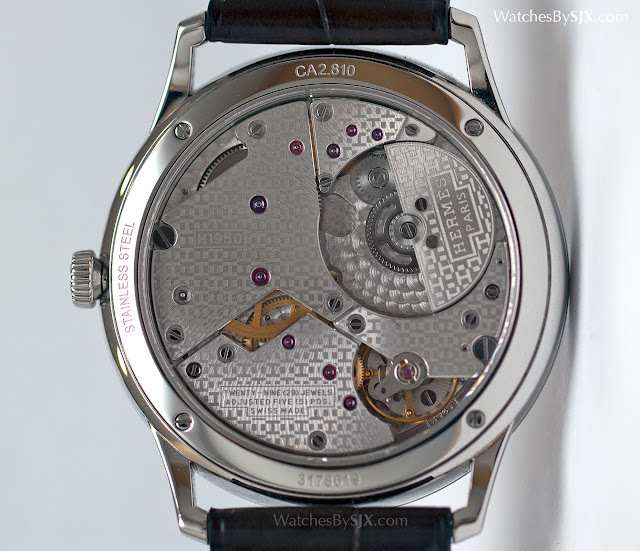 Notably, the same movement can be found in the Parmigiani Tonda 1950 and Richard Mille RM 33. 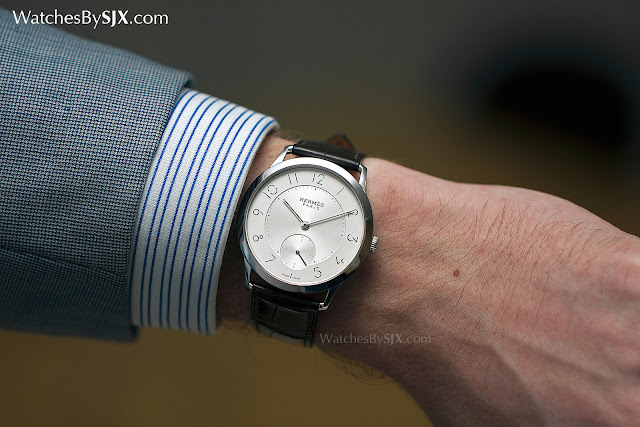 Vaucher is known for its sophisticated but pricey movements; the Parmigiani costs about half as much more than the Slim d’Hermes, while the RM 33 price tag is fivefold. 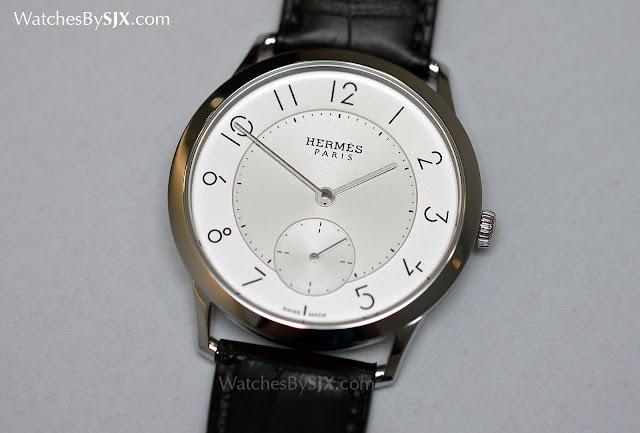 Rarely does anything from Hermes compare well price-wise, but the Slim d’Hermes certainly does.